how much did this project cost altogether? 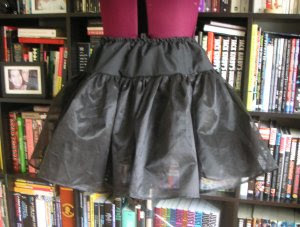 I've made three petticoats now out of net tulle... and they all started out nice but ended up flat and lame. But your organza one looks like it'll stay foofy! Naka - I bought the organza at John Lewis so probably about £20. If I did it with net probably more like £4.